There’s rabbit season. There’s duck season. Then there’s assault-on-your-wallet season otherwise known as the holidays. And though retailers are going to try their best to separate you from your hard earned money during the last few months of the year, it doesn’t have to be that way. Check out this episode of #MoneyMonday for tips on how to manage your holiday spending plus advice on how to take advantage of other people’s spending to make more money for yourself this time of year. Will LeBron James ever skate to center ice to accept the MVP award of the National Hockey League? Will Tiger Woods ever hoist the Lombardi trophy after leading a fourth quarter drive to win a Super Bowl Championship? Will Peyton Manning ever throw a complete game no hitter to win the World Series? Because they are playing the wrong game. And I get it. I use those questions to make the concept easy to understand. Yet, when I move on and ask these same individuals to apply the concept to their own lives, suddenly they can’t grasp it as well. See, in my experience as a financial advisor, I’ve come across many individuals who say that they want <INSERT SOME GREAT LIFE GOAL HERE>, yet they aren’t currently playing, or seem to have any plans to play in the near future, the game that will afford them opportunities to achieve said goal. There’s the young professional that confidently states that she wants to be financially independent by age 40, but has been stuck for years in a job with no advancement opportunities, a mediocre salary and only cost-of-living increases each year. There’s the mid career manager that says she wants to be a best selling author, but is too busy in her dead end job to schedule time to actually write the book. Oh, and I can’t forget about the gentleman who says he has a burning desire to become an entrepreneur and be his own boss, but can’t get around to actually starting a business because he keeps pursuing additional degrees. These individuals often come back to my office angry, frustrated, exhausted and confused as to why they haven’t achieved the level of success they so desire. My answer to all of them? You’re playing the wrong game. Remember that time in 1993 when Michael Jordan led the Chicago Bulls to the first NBA Championship 3-peat in 27 years, won his 3rd consecutive NBA Finals MVP, and set a Finals record by averaging 41 points per game, then followed that up by retiring from basketball to pursue a career in baseball? Yeah, I scratched my head too. 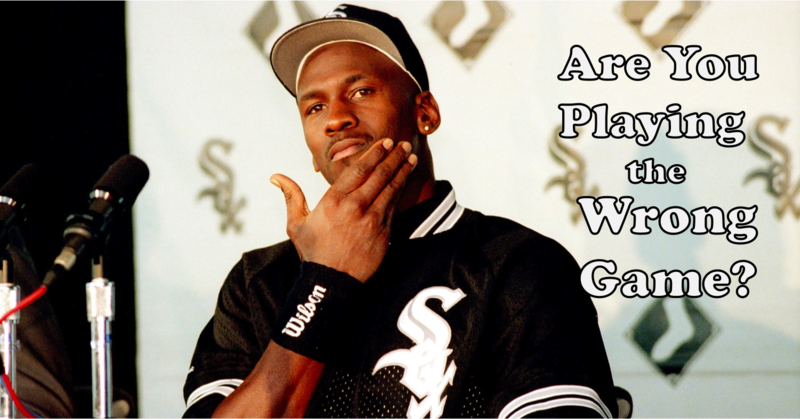 Sure, trying new things can be rewarding, but Jordan must have realized that his destiny would not be found on a baseball diamond. He soon returned to the court, won three more championships in a row, three more Finals MVP awards and was inducted into the Basketball Hall of Fame in 2009. He realized that if his true desire was to be remembered as the greatest basketball player in history then for those two years he played baseball, he was playing the wrong game. Similarly, if you say that you want financial independence at a young age, but you’re playing the “I’ll-have-to-work-here-for-fifty-years-save-every-penny-invest-and-pray-that-I’ll-have-enough-money-when-I’m-sixty-five” game, how can you really expect to achieve your desired result? Unless you’re aiming to invent the book the writes itself, not spending time writing will never get you on the bestseller list. If your chief aim isn’t to break the Guinness World Record for time spent in a classroom, collecting degrees won’t suddenly turn you into a risk taking business owner. The things you say you want in life have to be congruent with the game you’re playing in order to achieve them. Working hard in the wrong game is simply a waste of time. I understand. It can be difficult to determine if you’re playing the wrong game. Many times you’re so focused on the next play, that you don’t realize that you’re on the wrong field, in the wrong stadium, in the wrong league. One of the best ways to determine if you’re playing the right game is to simply pick your head up and look around you. Take a look at your boss for example. Is he financially independent? Does she take 10 weeks of vacation every year? Has he achieved the goal you’re after? Well, guess what, that’s the path you’re likely headed on and it looks like it leads to a place you don’t want to be. You need to start playing the right game, pronto. If you apply this simple three-step framework, I believe that you will get yourself back on the right “track” in no time. You must always start here. Period. You’ll never be able to choose the right game if you have no idea what reward you want to pursue. Unfortunately, many people get to the 7th inning stretch of life only to find out that baseball doesn’t hand out the Superbowl trophy they’ve been looking for. Decide what it is that you want. Now. If you want to win the Indy 500, you better be driving a racecar everyday. Similarly, once you decide that you want to build real wealth, you’ll soon realize that had better be on an accelerated track in a position with high income potential, have a sales job or other role such as a banker or lawyer that affords high commissions on transactions, or own your own business. If you will be 100% honest with yourself about what it is that you want, the game that you need to play will become readily apparent to you. Average players don’t make the hall of fame. You don’t have to be outstanding at every aspect of the game, but in order to be great, you need to identify the one or two things you are better at than anyone else, and focus on them. It’s not enough to want to be a great baseball player. Will you be a great pitcher or a great hitter? Will you hit for power or for average? Will you steal bases or drive in runs? Are you a great designer of products? Are you an amazing communicator? Can you organize large revenue generating events in a single bound? You may not think of yourself as a super hero. You might not have someone who is constantly telling you how great you are at what you do. But I can almost guarantee that you have a particular set of skills that you perform so flawlessly and naturally that you don’t even realize you’re doing it. In order to be wildly successful, you must identify this superpower and work tirelessly to accentuate it and use it to your advantage. Babe Ruth wasn’t the fastest player in major league history, but when you blast the ball over the outfield wall 714 times, you can take your time rounding the bases. Once you’re playing the right game, and you’ve determined the type of player you are going to be, you must set a deadline for yourself on obtaining your desired outcome. 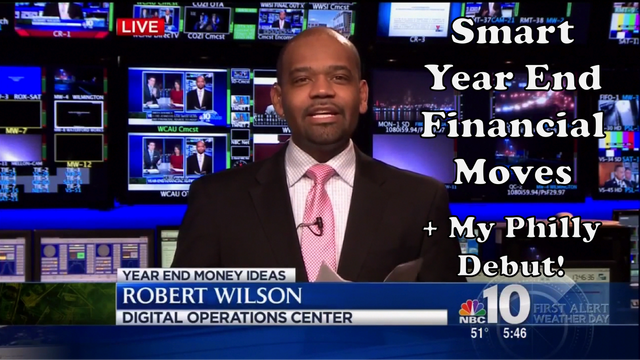 Do you want to be financially independent by age 40? You’re going to have to start making more sales calls than you would if you were ok waiting until you are 68 for financial independence. Do you want to be CEO of your company by age 37? Waiting for feedback during your annual review isn’t going to cut it. You need to be proactively seeking out high profile projects that will lead to your skills being rewarded. You must know that “one day” is not a deadline. You can’t circle “one day” on a calendar. If you’re indifferent as to the time it should take to achieve your goal, you are, in fact, indifferent about even achieving the goal all together. Your goal will require you to be very deliberate about playing the right game with an understanding that you are also racing against the clock. After all, the time you have to play the game is not indefinite. And you can’t cement your standing as the best basketball player of all time while you’re playing baseball. Alibaba Went Public and I Debuted on CNN! You know by now that I believe that reading is FUNDamental! If you read what others don’t, you’ll gain insights that others don’t have, and that will ultimately help you create the financial life you are striving for. Here are my recommendations for what you should read this summer while you TAN (Take Action Now)! Jason was the very first guest on the Movers & Shakers Podcast, and we were lucky to have him. 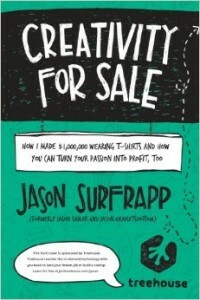 He dropped tons of knowledge in that episode, and now he’s taken it a step further by releasing first book, Creativity for Sale. If you’re new here or you missed the episode, Jason is the guy that first figured out how to make 66 grand wearing sponsored t-shirts everyday for a year. Then he sold his last name for 50k. Finally he has this entire book sponsored before he finished, and he breaks down how you can do the same. Stop waiting for someone else to pay you. Get creative. Make your own money. ACTION ITEM: As you read the book and get inspired. Write down your 5 wildest, most creative (and legal) ways you can come up with to make money. Don’t hold back. Never before in the history of mankind have there been more tools available to help you reach and audience of potential customers. FB, YouTube, Twitter, LinkedIn, etc. etc. But, you can’t build a house with a plunger. Similarly, social media tools won’t be of much use to you if you don’t use them properly. That’s where Gary comes in. He is definitely a trailblazer in the social media space. He gets in and masters these tools, and makes money from them before you even know they exist. But that’s ok, you can benefit from his knowledge. What’s the overall secret? JJJRH stands for Give, Give, Give, Then Ask (for the sale). 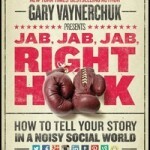 Read JJJRH to help you take the creative idea you developed and build a community of potential buyers using social media. ACTION ITEM: Pick ONE idea from action item 1, and pick TWO (and only two for now) social media tools and develop a strategy to build a community around your new creative product or service. You have an idea. You’ve built a community of people who like what you have to say. Now it’s time to sell your product. But you can’t just put up a post on FB and say, “Hey, here’s my product, you can buy it now…if you feel like it.” This isn’t Field of Dreams. You can’t just build it and think they will come. There’s an art to completing the sale. It’s a skill that can be learned. Jeff will teach you. He’s made millions of dollars online, and has taught others to do the same (to the tune of more than $500M of products sold by his students) by using his Product Launch Formula. Build anticipation around your product (ever notice how movies are promoted?) Help your customer understand that they have a problem. Help them solve it even if they don’t buy from you. Then describe how you can save them time and energy buy letting you solve the problem for them. ACTION ITEM: Once you’ve picked and idea and built up a small community, use the techniques in Launch to get your product out there, start making sales, and then make the product better over time. 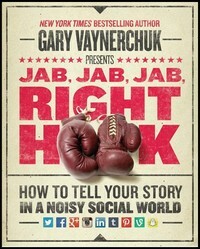 Oh, and to help jumpstart your action taking, I’m giving away a few of Jason’s books. Go here to find out how you can win! I’m not the type of guy that likes to say “I told you so!” I don’t however have a problem writing it, so here it goes…I told you so. I got feedback from a number of people who felt as though they were financially independent because they have a prestigious, well-paying job. I don’t often quote CB, let alone twice in one post, but when I do believe me it’s for a good reason. See, you should know that corporations aren’t loyal to you, and that’s ok. Nor should you feel any loyalty to them. The corporation’s reason for existence is not to keep you employed. Its job is to maximize profit for its shareholders. Once you realize that you indeed are your own corporation, then it must follow that you have the same reason for existence, to maximize profit for your shareholders, whom just so happen to be you and your family. To do that, you must have an intense focus on becoming financially independent. Oh, you still think you’re financially independent because you don’t work at Microsoft? Well ask yourself how you would feel if I replaced Microsoft with the name of your company in that headline, and you were one of the 18,000 people whose jobs are being eliminated. Would you be happy? Sad? Scared? If you’d immediately start polishing up your resume because you couldn’t last very long without a paycheck I have news for you, you are not financially independent. I define financial independence to mean that you do not rely on a paycheck from one employer to cover your living expenses. You have assets that generate income to pay them for you. This income may come from a business (not self employment), rental real estate, stock dividends, bond interest, royalties, etc. In other words, the income comes from sources that do not require you to be at a certain place at a certain time everyday. Now, I certainly hope that these Microsoft employees had multiple streams of income. I hope they did freelance coding on the weekend. I hope they have their own income generating mobile applications. I hope they were already on their third interview with another company because they could see this coming. But sadly, I’m guessing that many didn’t. They were fooled into believing that the company had their back because they kept the fridge stocked, handed out t-shirts and offered a complimentary ticket to the holiday party. Those t-shirts won’t pay your electric bill though. Your job is not your girlfriend. You can’t “cheat” on it because you don’t have a relationship with it. You have an obligation to do your best work while you are there, and in exchange you’ll be paid for your efforts. Period. End of story. That’s it. Other than that, your obligation is to do what’s best for you and those that you care about. And that means never again putting your livelihood in the hands of one company. Most likely, you also sat through a somewhat inspirational, borderline boring and almost certainly cookie cutter keynote speech in which some notable person implored you to shoot for the stars. Whether the speech fired you up or simply served as an opportunity to take a few more graduation selfies, that type of speech was probably appropriate for that occasion. Now, it’s time for you to get some REAL advice. The skills that got you through school aren’t the same skills that will lead you to success in life. You’re going to have to think differently if you ever want to pay those student loans back in a reasonable amount of time. Since my invite to speak at your graduation must have gotten lost in the mail, I’ve put my best tips for you (the recent grad) and for the no-so-recent grad to implement to enhance your chance at success in today’s environment. The idea of having a “career” is cute, but it doesn’t exist anymore. Face it, your parents had “careers”, but you won’t. Pensions are a thing of the past. No one goes to work for a company for 40 years and then has the company pay them for the rest of their lives. Because there are no more pensions, you and you alone are responsible for your retirement. This means, you better get good at managing your money…fast. Because of these major shifts in business, you no longer work for a company. Everyone is their own business now. You work for yourself. Period. You are not a businessman, you’re a business…man (thanks Jay-Z), your “boss” is your client. Now, a business with only one client is a business that can go out of business any day. Do you think it’s smart to run a business and serve only one client? No? Well why are your running your business that way? I’m sorry, but I have to tell you something. It IS about the money. If we agree that you are a business, then just like any other business, your obligation is to make as much profit for your shareholders (you and you family) as possible. I’ve said before that you’re probably in a race to save $2.5 million as soon as you can, so that you can live on at least $100,000 in retirement. With that goal in your mind, are you going to sit around and wait for your boss to give you a 3% raise this year? I doubt it. College was very regimented. You knew what you had to do to succeed. Write your paper. Cram for your exam. Rinse and repeat. In real life, there is no guidance counselor to make a success schedule for you. In fact, outside of your spouse, your parents and your dog, no one cares if you are successful or not. It you’re waiting on someone to “discover” you, pick you, promote you or tell you its ok to do something great…you’re going to be waiting for quite sometime. Get over it. You deserve it as much as the next person. It’s action that determines who gets the spoils. For the rest of my golden rules for college grads check out this week’s #MoneyMonday video (above) where I’ll tell you two major things that will deterrnine where you end up in life and the one person that can speed up the process of getting there. You’ve spent 4 (5? 6?) years of your life and nearly $100,000 (even if you had grants and scholarships, that’s the sticker price) learning. You have what you need. Now go get what you want.